The Aqua Pad is a third-party six button control pad for the Sega Mega Drive, common in regions such as South America. At least two types of Aqua Pad exist, one which is only compatible with the Super Nintendo, and a later model (with slightly different labeling) which is also compatible with the Mega Drive. Both share the same layout, complete with colour scheme and turbo switches. 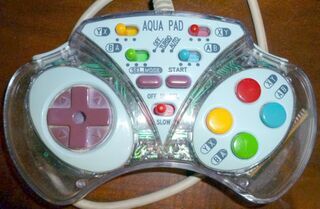 At present, it is unclear who created the original Aqua Pad (although this model credits Dynacom), however it does share similarities with other controllers such as the Game Pad 3 by Performance (suggesting its roots may lie with Recoton).